The rent at The Madison Apartments ranges from $907 for a one bedroom to a $1,075 two bedroom. Apartments in this building are about 28% more expensive than the Greenville average. This is a pet-friendly apartment. This apartment is in Greenville. Nearby parks include Peppermint Park, Jaycees Park and Harrington Field. The Madison Apartments has a Walk Score of 30 out of 100. This location is a Car-Dependent neighborhood so most errands require a car. The Madison offers a new leading edge clubhouse, a cyber cafe with Starbucks machine, state of the art fitness center, premium outdoor grilling area, resort style swimming pool and a pet park. Our posh interiors include granite countertops, undermount stainless steel sinks, 2 stylized wood blinds and brushed nickel fixtures throughout. The Madison has unique 1 and 2 bedroom floorplans to accommodate the upscale lifestyle. We are conveniently located in Greenville's top location, South Greenville. Explore how far you can travel by car, bus, bike and foot from The Madison Apartments. 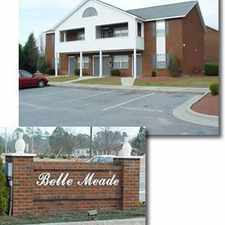 The Madison Apartments is in the city of Greenville, NC. Greenville has an average Walk Score of 33 and has 84,554 residents.